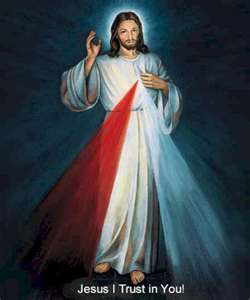 The devotion to Jesus as “the Divine Mercy” reflects the writings of St. Faustina Kowalska, a Polish nun who wrote a diary of about 600 pages recording the revelations she received about God’s mercy. Even before her death in 1938, devotion to the Divine Mercy had begun to spread. Saint John Paul II beatified Sister Faustina, a member of the Congregation of the Sisters of Our Lady of Mercy, in Rome in 1993, and canonized her on April 30, 2000, the Second Sunday of Easter, as the first saint of the Jubilee Year. During his homily at the canonization, the Pope declared that the second Sunday of Easter would from then on be celebrated as Divine Mercy Sunday throughout the universal Church. A number of parishes in the Fall River Diocese offering devotions on Divine Mercy Sunday. Please contact your parish or one of interest for information. For more information about the Divine Mercy devotion, visit the National Shrine of the Divine Mercy website.